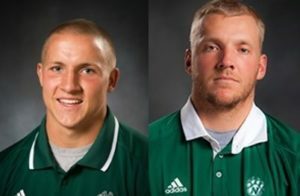 Two Northwest Missouri State football were injured Tuesday evening on I-29 in Andrew County after the vehicle they were driving hit a slick spot and went off the road. 22-year old Cole Forney, a senior from Maryville, Mo. and 22-year old Jacob Vollstedt , a senior from Iowa City, Ia. were involved in the wreck. According to the Missouri State Highway Patrol’s report, Forney was driving a 2006 pickup truck heading south on I-29 just north of St. Joseph. His truck hit a slick spot and slid off the road and struck a concrete barrier, ejecting Forney before finally coming to a stop back on the southbound lanes before it burst into flames. Vollstedt was able to escape. Both Forney and Vollstedt were originally taken by ambulance to Mosaic Life Care in St. Joseph. Forney is listed with serious injuries, Vollstedt’s injuries are moderate. Forney was not wearing his seat belt. Head football coach Rich Wright tweeted an update later on Thursday.